Even when you have a healthy lifestyle, wrinkles will appear sooner or later. Your face, hands, neck and décolletage are sensitive to developing wrinkles. There are various wrinkle treatments that can soften wrinkles or even make them disappear. A wrinkle treatment at Van Lennep Kliniek offer a safe way to age gracefully; who wouldn’t want to be the best they can be! With or without fillers and Botox? Which (anti-)wrinkle treatments are best? There’s no clear answer to that. The best wrinkle treatment for you will, first of all, depend on your wishes. You may be considering treatment with injectables, such as fillers or Botox, or perhaps you’d rather be treated without the use of a needle. Obviously, we’ll also look at the type of wrinkle and its location. In some cases, multiple treatments are combined for a natural-looking result. Are you interested in a personalized wrinkle treatment? Please make an appointment for a free consultation. Then you can indicate your wishes and the cosmetic doctor will discuss the possibilities. 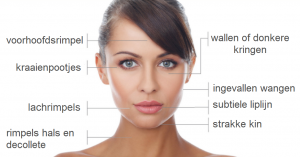 Wrinkle treatments The Hague, Leiden- Noordwijk or Oegstgeest? The staff at Van Lennep Kliniek are certified and have extensive experience. At Van Lennep Kliniek we only work with products from top brands that have been scientifically studied and proven to be safe. You can count on our qualifications, competence, and extreme accuracy. All treatments are carried out in accordance with the guidelines of the NVCG (Dutch Association of Cosmetic Medicine). A wrinkle treatment without injectables is done completely without using a needle. Your skin is renewed through a beauty treatment or massage. It’s ideal for fine lines. Connective tissue massage; a natural facelift or connective tissue massage ensures skin renewal and is done without the use of injections or injectables. Peelings; The Environ and ZO Skin Health peelings effectively address skin problems such as wrinkles. Fractional laser; the laser has a skin-improving function and stimulates both the renewal of the epidermis and the production of collagen in the dermis. Radiesse; sometimes called liquid facelift, for volume improvement through the production of collagen. Sculptra; for long-term effects based on polylactic acid. Restylane and Juvéderm; also known as hyaluronic acid, available in various versions for refining wrinkles but also for lip enlargement. Botox is a muscle relaxant and works extremely well on tight muscle groups that cause wrinkles, such as frown lines. It’s also possible to use a combination of Botox and fillers. These high-quality injectables are very safe and each has its own effect. Therefore, each wrinkle treatment will start with an intake interview. It’s an opportunity for you to make your wishes known, and the doctor will ask you about your medical history. When it comes to designing your individual treatment plan, you should be aware that multiple treatments may be needed to create a natural-looking effect.